One of the most durable virtues of Harry Christophers and The Sixteen is the unfussy fluency of their musical endeavour – and the expressive transparency they bring to repertoire where they feel especially at home. Unlike Handel, Bach is hardly daily bread for them and yet their performance of two ‘parody’ Masses (for which we have almost all the original cantata material) conveys an extraordinarily easy and uncluttered approach, if one which, rhetorically, stands aloof from some of the more intensely coloured and urgent readings from recent continental ensembles. The Sixteen could not be better suited to the genial abstraction of the sunny Mass in G major, BWV236. How organically and devotionally Christophers shapes the stile antico of the opening Kyrie; there’s also something profoundly patient and measured about the way he embraces Bach’s mature contrapuntal fabric in the opening ‘Gloria’. Indeed, with such a spacious outlook, Eamonn Dougan delivers a nobly conceived ‘Gratias agimus’ (underscored lovingly by David Miller’s theorbo realisations), allowing us to rejoice in Bach’s unfailingly effervescent setting of these words, with equally open-hearted contributions from the other fine soloists. Christophers’s inclusion of Cantata No 79 is an agreeable reminder of Bach’s deft transformational skills, in the adaptation of two movements from this 1725 Reformation cantata to the later G major Mass. Yet it is the A major Mass, BWV234, which gives the most unexpected pleasure. 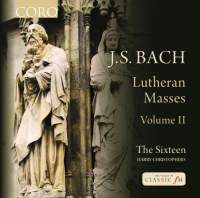 This is a work that has divided the critics over 150 years of Bach scholarship as to whether the dramatic nature of the material – in the case of Cantata No 67, the source for the ‘Gloria’, a true Vox Christi prevailing over the devil with the power of peace – can be successfully transformed into the relatively abstract imagery of the Ordinary of the Mass. The Sixteen’s answer is to bring a direct, almost seamless objectivity to the Latin text but furnished with a compelling warmth and soft-grained delight in a distinctive harmonic and textural landscape still woefully under-appreciated by Bach lovers. There are more refined and exquisite performances – of which Raphaël Pichon and Pygmalion is currently the most irresistible – but there are few as unassuming and natural as this. Strongly recommended.